Bovine peripheral blood granulocytes stained with Mouse anti Bovine MHC Class I (MCA2444GA). Bovine peripheral blood granulocytes stained with FITC conjugated Mouse anti Bovine MHC Class I (MCA2444F). 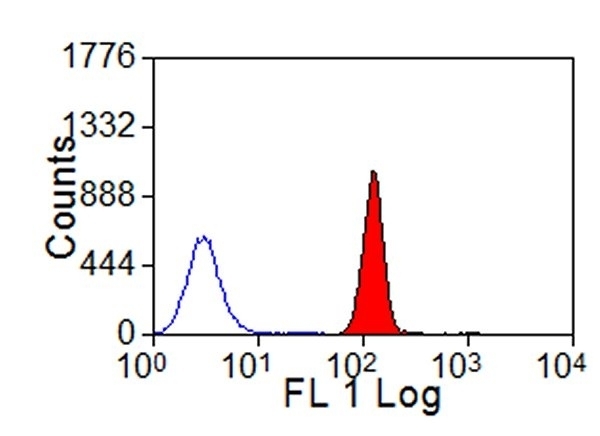 Mouse anti Bovine MHC Class I Monomorphic antibody, clone IL-A88 recognizes a monomorphic determinant within the heavy chain of bovine MHC Class I. Bovine MHC class I molecules are expressed at varying levels on most nucleated cells, with exception of neural cells. 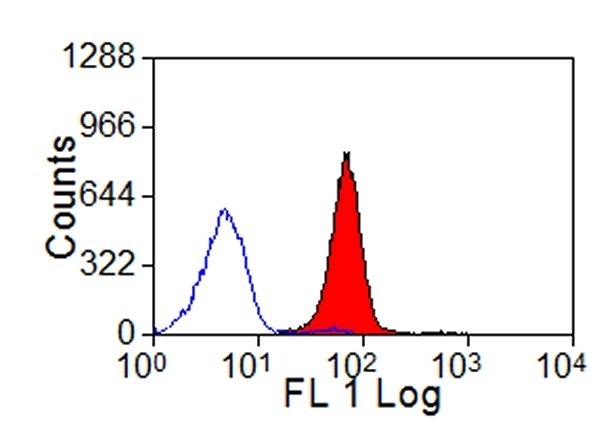 This antibody immunoprecipitates a band of approximately 45 kDa under reducing conditions. Bovine peripheral blood mononuclear cells. Ambagala, A.P. et al. (2000) An early pseudorabies virus protein down-regulates porcine MHC class I expression by inhibition of transporter associated with antigen processing (TAP). J Immunol. 164 (1): 93-9. Daubenberger CA et al. (1999) Bovine gammadelta T-cell responses to the intracellular protozoan parasite Theileria parva. Infect Immun. 67 (5): 2241-9. Araibi, E.H. et al. (2004) Downregulation of major histocompatibility complex class I in bovine papillomas. J Gen Virol. 85 (Pt 10): 2809-14. Ashrafi, G.H. et al. (2002) Down-regulation of MHC class I by bovine papillomavirus E5 oncoproteins. Suzuki, T. et al. (2003) Evaluation of the delta subunit of bovine adaptor protein complex 3 as a receptor for bovine leukaemia virus. J Gen Virol. 84 (Pt 5): 1309-16. Stephens SA & Howard CJ (2002) Infection and transformation of dendritic cells from bovine afferent lymph by Theileria annulata. Toye, P.G. et al. (1990) Transfection into mouse L cells of genes encoding two serologically and functionally distinct bovine class I MHC molecules from a MHC-homozygous animal: evidence for a second class I locus in cattle. Marchetti, B. et al. (2002) The bovine papillomavirus oncoprotein E5 retains MHC class I molecules in the Golgi apparatus and prevents their transport to the cell surface. Bainbridge, DR. et al. (2001) Increased expression of major histocompatibility complex (MHC) class I transplantation antigens in bovine trophoblast cells before fusion with maternal cells. Goh, S. et al. (2016) Identification of Theileria lestoquardi Antigens Recognized by CD8+ T Cells. PLoS One. 11 (9): e0162571.